We've had a great week as we have kicked off our 100 Acts of Kindness challenge! My kids and I started off the week by making simple "kind hearts" to keep tracks of the acts of kindness that we do. We still have several to go to complete our 25 kind acts for this week, but we really enjoyed having something tangible to help us visualize all of the kind acts we are performing. If we do at least 25 acts of kindness each week we will complete 100 before the end of our kindness challenge! Materials Needed: cardstock, markers, scissors. tape, vase, and straws. Tape each heart to a straw. 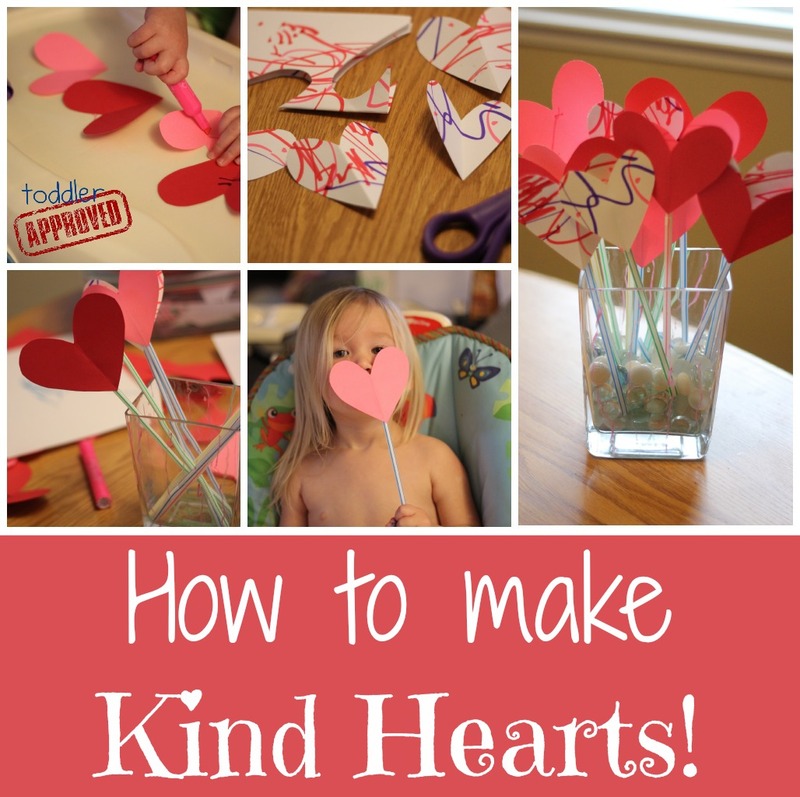 As you or your child complete acts of kindness, write what you did on the heart and stick it in your vase. 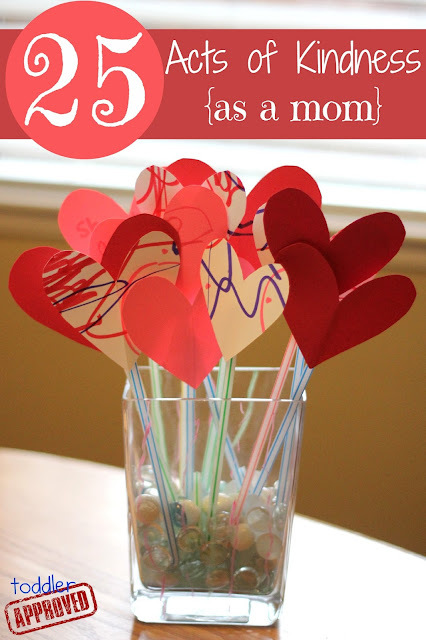 Once you're done, you'll have 25 beautiful kind hearts in your vase to remind you of all of the kind things you've done! In addition to helping my kids perform acts of kindness for others, I am working to do my own set of 25 acts of kindness each week of our challenge. Here are my 25 "mom" acts of kindness that I plan to work on over the next few days! Cuddle or hug to start and end the day. Have a scheduled tickle time. Host a family freeze dance party while we're waiting for dad to get home from work. Say "yes" immediately as often as I can, instead of "in a few minutes." Snuggle extra with the baby in the middle of the night instead of being grumpy that I'm awake. Make a special dinner featuring the kid's favorite things. Read an extra two or three or four books at bedtime or naptime, just because. Use please and thank you more often. Give hugs for little things. Put away away my phone and my computer and be present all day long. Do several of the kid's favorite messy craft projects and not worry about the mess. Heart attack the kid's doors with paper hearts that tell them my favorite things about them. Notice the thoughtful things my kids do more often and thank them. Use a kind tone, even when I am frustrated. Sit down and do unstructured playtime with my kids for a solid chunk of time without any interruptions. Look through pictures together of my kid's favorite moments during the past year. Listen and respond in a nice way, even if my son is telling me something he's already told me several other times. Make a smiley face with whipped cream on my kid's waffles in the morning. Schedule an individual date with each of my kids to do something fun that they love. Teach each child a new skill (my goals: memorize a new song with my son and teach my daughter to put on her own shoes). Let me kids catch me gossiping to someone else about all the sweet and wonderful characteristics they have. Go on a special adventure together. Let them help me with a special project or special chores usually reserved for just me to do by myself. Say "I love you" a lot and tell them why. If you're just joining us, head on over to our 100 Acts of Kindness Project 2013 landing page to get caught up and let us know that you will be participating! LOVE this list! Such great idea's. I think I might just have to try out a few! Thanks! Thanks for the ideas! I'm always looking for new ones to use with my young boys. I just learned about the 100 Acts of Kindness Project, and I LOVE it even though I'm late to the party! I especially like the idea of heart-attacking the kids' bedroom door, I think I may work on that one tonight. I love your kind hearts. What a perfect way to keep track of your 100 Acts! What a beautiful idea-very inspiring! Thanks for sharing this. I have started my kindness list-I'm a bit late but I won't let that stop me! Just had to say that this is a wonderful list. I'm a Marriage and Family Therapist and mother of six grown children. I've shared the link with my clients on my Facebook page! Great job encouraging other moms.